I love the Law of Unintended consequences. We make decisions for one reason and later discover another result that no one foresaw. No one predicted what would happen when we passed a law to protect marine mammals. Once upon a time, one rarely saw seals off the coast of Massachusetts. A sighting could bring Nantucket ferry passengers crowding to the rail for a view. Back then, fishermen shot gray seals to prevent them from competing for the available fish catch. The Commonwealth actually paid a $5 bounty for each seal nose turned in. We went to Nantucket every year from 1970 to 1978 and saw nary a seal on the breakwater going into the harbor. Returning in 1990, we were surprised to find them sunbathing on the rocks, unperturbed by ferries, boats, swimmers, cameras and tourists. What happened? Simple: We eliminated human beings as seal predators. Massachusetts banned killing seals in 1965 and the Marine Mammal Protection Act took effect nationally in 1972. The gray seals and harbor seals continued to do what they have always done—make baby seals. With no natural predators and human predation eliminated, the seal population grew exponentially. By 2017, surveys estimated a population of 30,000 to 50,000 in the Cape Cod area. The number has probably grown since then. Nature being red in tooth and claw, however, it was only a matter of time until the seals’ predators figured out where to find a pinniped picnic. Bring on the sharks. And not just any sharks but Carchardon carcharias—the Great White. Before the seal population explosion, the only sharks in New England waters were the small dogfish that make a nuisance of themselves by tearing fishermen’s nets but don’t really frighten anyone. The Great White Shark is an entirely different beast. And as the seal numbers grow, so does the shark population. We’ve all seen Jaws, the 1975 movie that put Great White Sharks on the horror story map, or Shark Week on the Discovery Channel. or the Sharknado movie series. We know that they are big, fast, voracious and pretty darn scary when encountered up close and personal. The larger females can grow up to 20 feet and 4200 pounds while males grow to 11 to 13 feet long. 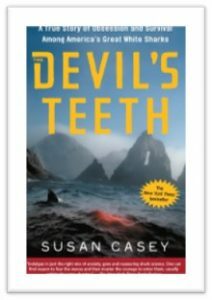 In her excellent book, The Devil’s Teeth, Susan Casey gives us the findings from her onsite research into Great White populations off the Farallon Islands west of San Francisco. Out there, where the water is cold, the fish are plentiful, and human beings are forbidden, the Great Whites grow very large. Ms. Casey tells us they can barrel up from the deep at 30 miles an hour and hit their prey before the seal knows what happened. The waters off Cape Cod don’t run that deep and they are Gulf Stream warm but the Great Whites come here for the same reason—to munch on the limitless shore dinner of gray seals. Cape Cod also happens to be one of New England’s most popular vacation spots and its waters provide good swimming for millions of tourists and vacationers. The miles-long beaches do not lend themselves to shark nets or other forms of protection used to separate swimmers from predators. That means people and Carcharodon carcharias mingle freely. It does not always end well. Summer now means a regular supply of shark encounter stories from the Cape on the evening news or in the morning Boston Globe.People swim, surf, fish, kayak, and paddle board off the beach. Sharks patrol the beaches looking for food. They don’t fortunately, attack humans randomly, despite Peter Benchley’s best efforts to make us believe that. But if you’re paddling your surfboard out past the break or paddle boarding alongshore, you just might look more like a seal when seen from the depths than you realize. Sharks can also be opportunistic feeders. 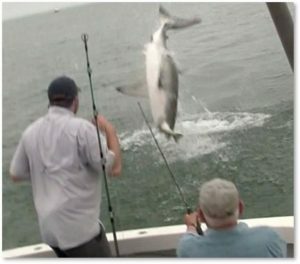 Numerous online videos show Great Whites stealing fish off the line before the fisherman can reel it in—or even coming right out of the water to chomp down on the catch. One minute you are hauling in a beautiful striped bass; the next you have a fish head. 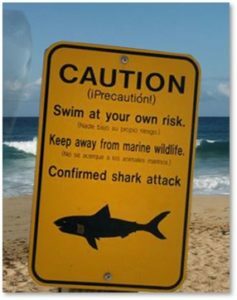 You would think that the presence of an apex predator just off the beach would deter most people from going in the water but that’s not the case. People still flock to the Cape Cod beaches and swim seemingly without fear. Officials sometimes close beaches when spotter planes report a shiver of sharks in proximity to swimmers. Otherwise, you’re on your own. A man was attacked on a Cape Cod beach this year. The odds are in your favor, though. Massachusetts has documented only four unprovoked shark attacks. I prefer to just stay out of shark-infested waters. 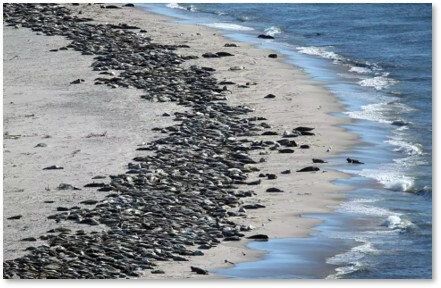 The laws, both state and federal, succeeded in their goal of increasing the seal population. I doubt if anyone expected the numbers to grow this large or that they would draw Great White Sharks to Cape Code. But that’s how the Law of Unintended Consequences works. This entry was posted in Animals, Books, Environment and tagged Cape Cod, Carcharodon carcharias. gray seal, Discovery Channel, Farallon Islands, gray seal, great white shark, harbor seal, Jaws, Marine Mammal Protection Act, Shark Week, Sharknado, Susan Casey, The Devil's Teeth by Aline Kaplan. Bookmark the permalink.